Horses are considered some of the finest animals known to man. Like any animal, during the hot summer months, horses need fresh, clean water to stay hydrated and healthy. Every horse is unique to its own. Therefore, the needs of your horse will differ from the needs of other horses. Play close attention to air temperature, work load, food consumption, size, and health of the horse. All of these factors help determine the amount of water your horse will need to stay healthy. Horses should always have water available in their stables and pastures to help maintain their health. 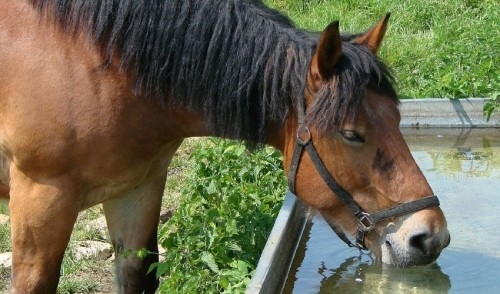 There are multiple ways to provide fresh water for your horses. One way to provide fresh water for your horses is using a good old fashioned bucket. Buckets are simple and easy to use. They are also easy to clean. However, the downside to using buckets is that they are heavier to carry and can spill unless safely secured. This could require more time and effort than you may have to properly provide water for your horse. Another way to provide water for your horses is automatic waterers. Automatic waterers offer a more convenient way of providing fresh water for your horse, and can also be used outdoors in the pasture. When using a automatic waterer, your horse may not know how to use it at first. Therefore, be sure to encourage your horse to use the waterer and use it properly. Automatic waterers need to be cleaned and refilled regularly. They can often become filled with leaves or insects, which should be cleaned out daily to prevent bacterial formation. Containers should also be scrubbed every week to prevent algae build up and debris from contaminating the water. Sometimes the frequency of cleaning the containers can change depending on the time of the year and how quickly it becomes dirty. Always make sure the bucket or automatic waterer is clean before your horse drinks from it. When in the pasture, it is possible to provide clean water for your horses from natural sources, but be sure to test it before allowing your horses to drink from it. Call your local health or agricultural extension to get professional advice about what is safe for your horses. Some owners rely on spring fed ponds or streams to provide water for their horses during the summer. When using natural sources, make sure the source is easily accessible for your horses. Any unsafe water sources should be fenced off to prevent your horses from drinking contaminated or unsafe water. Always provide clean, fresh water for your horses to protect them bacterial diseases and dehydration.